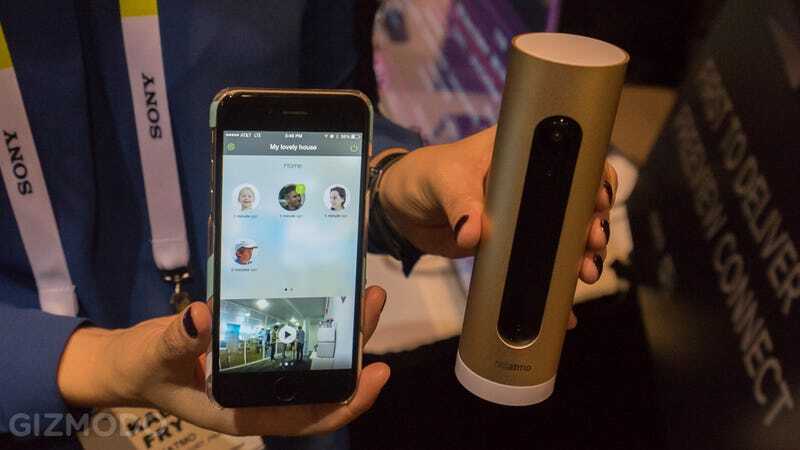 The latest product from connected products company Netatmo is a camera that can ID who's coming in and out of your home just by looking at them. The 170-degree Wi-Fi connected camera is appropriately called Welcome, uses facial recognition technology to figure out who's coming in and out of your house, and sends you notifications for the people that you want—or sends you a notification if some weirdo stranger just burst through the door. You might want to know when your kid gets home from the dance, but you might not necessarily care if your significant other just got back from the gym. There's no uploading photos to set the Welcome up. Instead, you use the camera itself to take photos of the people you want to be identifiable. Over the time, as the Welcome snaps more and more photos of these people, it gets smarter and smarter. There's no word on pricing for the Netatmo Welcome, but we're told it'll be available internationally at some point in the second quarter of this year.